The clocks have gone back and autumn is most definitely upon us. But, we’re a 365 day a year charity and we are delighted to still be welcoming lots of families down to the beautiful English Riviera for a much-needed break. Thank you to everyone who helps us do this. 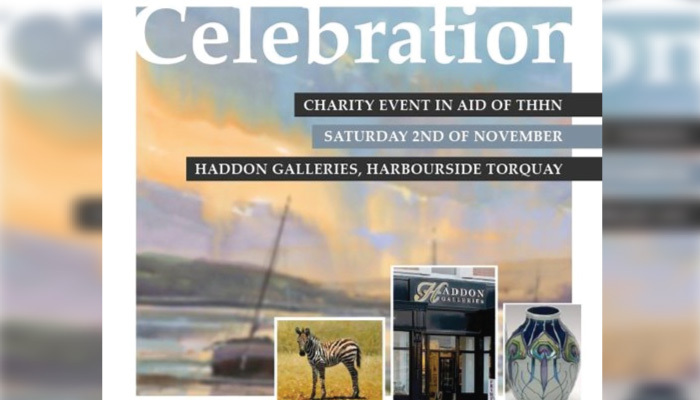 Haddon Galleries is hosting a lovely event at their gallery on Torquay harbourside on Saturday 2 November. The event is not only to celebrate Haddon’s recent win of Fine Art Retailer of the Year but also to raise money for us, which is fantastic. There will be various artists at the gallery throughout the event which runs from 2pm to 9pm, including Laura Wall and Mike Jackson who will both be painting in the gallery and signing prints throughout the event. From 7pm onwards it’s party time with live music from Noteable Duo, some delicious nibbles and refreshments very kindly donated by Waitrose and a raffle with an opportunity to win a selection of great prizes. The big event happens at 7.45pm when there will be an auction of some incredible items including some stunning artwork, the proceeds of which will come direct to the THHN. As well as that, Haddon is also giving the THHN 5% of all gallery sales on the day. If you’re in the area please do come along, buy a raffle ticket or two and enjoy a wander around the gallery. This month our wonderful Memory Maker Caravan at Finlake Holiday Park has been holiday home to families referred by the International Costello Syndrome Support Group, The Child Bereavement Charity, Victim Support and Kids Cancer Charity in Wales. It’s such a fantastic resource and the families are really enjoying their time there. As you know, THHN Founder Luke had three runs planned this year all to raise money for the THHN Bungalow Project. The total amount he has raised now stands at an amazing £3,800 and he ran 108 competitive miles in some pretty inhospitable conditions, much of literally up hill and down dale. Starting in April with the London Marathon which Luke completed in a pretty impressive 3 hours and 31 minutes, next up was a gruelling 69 mile ultra marathon in June along Hadrian’s Wall in Cumbria which Luke ran with friend Alick Forrester. Luke’s 2013 trio finished when he completed the Great West Run in Exeter on Sunday 13 October in just 1 hour and 41 minutes. Of his runs Luke says “Running is a hobby of mine and I have really enjoyed this year’s challenges. However I’d be lying if I said it wasn’t incredibly hard work. The ultra marathon in Cumbria really was the hardest thing I’ve ever done in my life and there were times during it when I simply couldn’t imagine finishing it. However, with the support of my family and my great friend Alick, somehow I managed to cross the finishing line.” Luke completed the ultra marathon in an amazing 15 hours and 12 minutes after battling across unforgiving terrain in terrible weather. He said “It was lovely to finish the year’s running challenges closer to home with the Great West Run in Exeter surrounded by a fantastic group of people who were also running to raise money for the THHN. There was a great atmosphere and I feel so lucky to have such a lot of support.” Talking of the Great West Run…. We were delighted to be an affiliate charity of the Great West Run in Exeter this year and huge thanks must go to the race organisers GO2 who did an incredible job and, of course, to all those who ran for us. A terrific team of 20 runners completed the race to raise money for us. We consider ourselves very lucky to have quite such amazing support from all of these athletes. Thanks must also go to Angels Tea Rooms, Pro Performance of Paignton, Bryony Boyce of Body By Vi, Total Produce Devon, Winners 2000 and Torbay Hospital Convenience Shop who all donated to our runners’ post race goody bags.” THHN runners were also each given a free post-run massage, courtesy of Dr Sarah Taylor and her team from Smart Practice Sports Massage and the THHN tent was set up in the race village and staffed by the brilliant Brian Lewis and his team of volunteers. We are thrilled to announce that the 2014 Plymouth Half Marathon organisers have made us an affiliate charity for their event. More info to follow but drop us a line if you’d like to register an interest in running on 27 April next year. Or if you don’t fancy running we are in need of finding lots of volunteers to help marshall the event, if you want to help we would love to hear from you! This month the wonderful Brampton Court Hotel hosted an incredible Irish Cabbage and Bacon Night, organised by Gerry Gilraine of Galliford Try along with hotel owners Sarah and Phil Watson and their staff. There was live ceilidh music, fantastic food and a brilliant time was had by all. There was also some extremely generous donating going on and the evening raised over £3,000. Thank you so much to everyone involved including sponsors John Clements Building and Civil Engineering, JP Construction and Civil Engineering, Zone Civil Engineering, Galliford Try Civil Engineering, Mulleadys Civil Engineering, Ballycommon Labour Supplies, Paul Murphy Civil Engineering, Mick Cunningham Civil Engineering, Barn Owl Pub and Restaurant, The Royal Exeter Hotel and the Rock Garden. Wonderful 11 year old Kyle has completed an awesome mini triathlon, all to raise money for us. So far he has raised over £300! You’re an inspiration, Kyle – thank you so much! Make sure you pop in and have a look around the gallery. This is your chance to celebrate Christmas with other THHN members, volunteers, fundraisers and Memory Makers – all welcome. There will be Mulled Wine on arrival between 7pm and 7.30pm and followed by a delicious four course meal at 8pm. After that, it’s time to get your dancing shoes on and enjoy the disco until 1am and try your luck in the raffle! Tickets are £24.95 each – to book, please email thhnchristmasparty@hotmail.co.uk Come and join us for a festive night of fun and merry-making. All profits donated to THHN! Please tell all your friends and help make this inaugural event a success! Stephanie Nimmo who ran the Bournemouth Marathon at the beginning of October to raise funds for us. Stephanie and her family had a THHN holiday a couple of years ago and Stephanie wanted to give something back. We don’t expect anything back from our holidaying families but it was lovely of Stephanie to do this. As if that wasn’t enough she also ran the Garmin Kingston Run Challenge for us two weeks later – impressive stuff. Riverford Torbay and South Hams Home Delivery, Claire’s Cakes, Halletts the Bakers, GB Fisheries, Save on Meats Torquay, Luscombes Butchers, Teddy’s Cakes and Total Produce Devon for all their wonderfully delicious food and drink that makes up our much appreciated welcome hampers. Judith Payne who held a clothes selling evening to raise funds for us – great idea. Pilgrims Rest Holiday Cottages who welcomed a family from the Rainbow Trust Children’s Charity. Gavin Burns, who completed the Amsterdam Marathon for us. The English Riviera Tourism Company (ERTC) who gave Luke the opportunity to address members of the Tourism Industry at their update at the Riviera International Conference Centre this month. It was a great chance to speak directly to lots of local accommodation providers and businesses and tell them a bit more about the work of the THHN. Babbacombe C of E Primary School who have made the THHN their chosen charity for this school year. The Marine Hotel in Paignton who gave a free holiday to a family referred by the CLIC Sargent team at Birmingham Children’s Hospital. The Brampton Court Hotel who welcomed a family referred by the Gloucester CLIC Sargent team. The Buccaneer Inn in Babbacombe who has just joined our network offering free holidays to THHN families – we are delighted to have you on board. You can now donate to the THHN by text. Simply text THHN93 followed by the amount you would like to donate to 70070. So simple.